If you love animals, especially bunnies you will want to attend this special event at the Inn at Gig Harbor for Rabbit Haven. I discovered a wonderful non-profit organization right here in Gig Harbor that is dedicated to rabbits. I want you all to know about this compassionate organization. Rabbit Haven is a nonprofit organization that was started 35 years ago by a Gig Harbor local, Sue. It is one of the very few organizations of its kind in the area. They provides shelter and sanctuary for the care of unwanted, abandoned and mistreated rabbits. These sweet cuddly bunnies deserve a loving home and they not only care for these gentle pets but find adoptive homes. They rescue about 50 rabbits a year, not only caring for them but each is spayed or neutered to help control the population. They are also educating the public on the care of these unique and wonderful creatures. Rabbit Haven is a non-profit maintained by volunteers and funded by the generosity of donors. To provide food and medical care requires an immense amount of time and money. You can help by donating, volunteering and attending this event. This auction is Rabbit Haven’s largest fundraiser where you can find amazing deals, have some fun while knowing your money is going to save these sweet animals. If you have Auction items to donate or want to sponsor the event or purchase a table please email RabbitHavenWA@gmail.com. 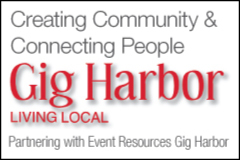 Do you know that the Inn at Gig Harbor has 6 different rooms to host private events? This gives you many options as you plan your various meetings, parties and special events. It is always a bonus for your events to have sleeping rooms to add to your private event.